"This is not a joke or a game, we are very upset about someone choosing to ruin the fun for Deerfield's children"
Zippy is a mannequin in a red onesie, a cap and mittens. He was last seen at the gate by Deerfield's Veasey Park on Monday. Good news: Zippy the Elf has been found by Deerfield police. Police in a New Hampshire town are looking for Zippy, a beloved life-size elf on a shelf that usually can be seen at various sites leading up to Christmas. 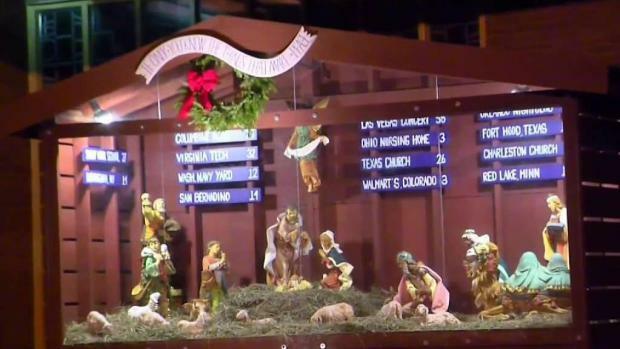 A church in Dedham, Mass., is drawing both praise and criticism for using its nativity scene to protest gun violence. The backdrop of the scene lists major mass shootings and the number of those killed. Deerfield Rescue Squad EMS captain Cindy McHugh says Zippy was in a beach chair with his sunglasses, an umbrella and a drink "taking in the sun." A Facebook post from the Rescue Squad says, "This is not a joke or a game, we are very upset about someone choosing to ruin the fun for Deerfield's children." This is the third year Deerfield has had Zippy, who shows up after the town parade the Sunday after Thanksgiving.